Mill Hall – WE DID IT! That was the cheer raised by the Kiwanis Club of Bald Eagle and Nittany Valleys at its annual Oktoberfest social event held on Oct. 23, 2018. In addition to enjoying German style food, beverages, and music, club members celebrated fulfillment of a Model Club pledge to the Eliminate Project, UNICEF and Kiwanis International’s joint service initiative aimed at eliminating Maternal/Neonatal Tetanus worldwide. As a result of its $27,000 donation, the club was able to help save over 15,000 lives of mothers and newborn babies in primarily third world nations. The club extends thanks to area residents and businesses who have supported fundraising for the project over the past five years. Because of this support, the club was able to have a real impact on the lives of people all over the world – while at the same time continuing its service to youth and communities here in the local area. 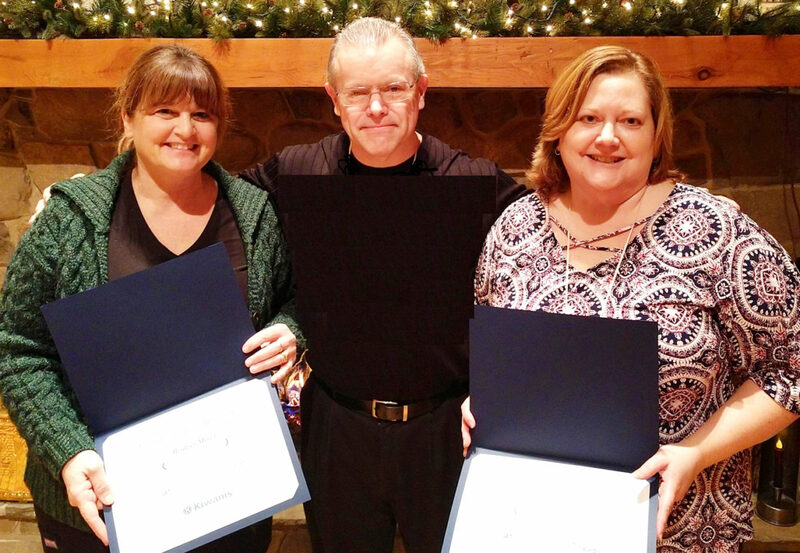 Kiwanis PA District Executive Director Kevin Thomas presents certificates of appreciation to Kiwanis Club of BENV Project Eliminate co-chairs Bridget Motel, left, and Sally Young, right. Club Project Eliminate co-chairs, Sally Young and Bridget Motel, were recognized by the Kiwanis Children’s Fund (KCF) for their fund raising efforts. On hand to present certificates of appreciation from the KCF president and Kiwanis International executive director was the Kiwanis Pennsylvania District Executive Director, Kevin Thomas. When Kiwanis International began this initiative, there were initially 59 countries affected by this horrible disease. Now, a mere seven years later, only 14 countries remain where the disease persists. As Kevin put it, these are going to be the toughest. They are in countries considered to be located in “global hot spots” which makes delivering and administering the lifesaving vaccine more difficult. Rest assured, Kiwanis International is not done. Clubs worldwide are dedicated to fulfilling their pledges so that mothers in these countries will have a better chance of delivering healthy babies. Hopefully all clubs will be as successful as the Kiwanis Club of Bald Eagle and Nittany Valleys!